Wade McCollum, Keith Pinto and Rachel Spencer Hewitt in Fly by Night. Photo by Mark Kitaoka. The Bay Area got a terrific introduction to playwright Kim Rosenstock this year, between Tigers Be Still, her hysterical comedy about crippling depression at SF Playhouse, and Fly by Night, the delightful musical that she cowrote with Will Connolly and Michael Mitnick, which premiered at TheatreWorks at about the same time. Set around the great Northeast blackout of 1965, this bittersweet romantic comedy of a nebbishy sandwich maker who strikes up a romance with an aspiring actress only to fall in love with her happy-go-lucky diner waitress sister seems like a recipe for disaster. But the end result is magical, between beautifully pared-down songs, a sly fractured chronology guided by a hilariously whimsical narrator, and a crabby sandwich shop owner who steals the show. It’s an absolute gem. 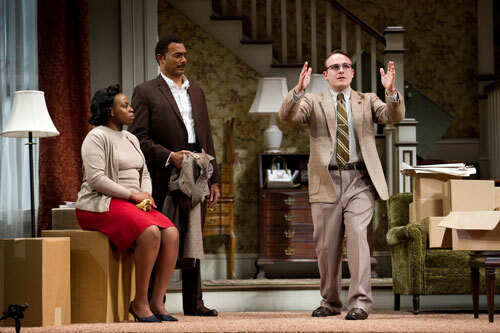 Omozé Idehenre, Gregory Wallace and Richard Thieriot in Clybourne Park. Photo by Erik Tomasson. Sure, it’s a little strange that Bruce Norris’s quasi-sequel to A Raisin in the Sun won the Pulitzer Prize when Raisin itself didn’t, but Clybourne Park is such a sharp and funny play that it’s easy to see why it did. Where Lorraine Hansberry’s classic deals with an African-American family about to move into an all-white neighborhood, and some future neighbors’ attempts to dissuade them, Clybourne is set entirely in the house they’re about to move into. The first act focuses on the white family who’s moving out in 1959, and what they’re going through at the time, and the second act takes place 50 years later, with concerned neighbors in what’s now a historic black neighborhood confronting a white couple’s plans to build the house up. The way people attempt to dance around the issue of race in both acts is hilarious and terribly revealing, and director Jonathan Moscone and a tip-top cast brought it all out beautifully. For better or for worse, this was also a boom year for wartime atrocities in local theatre, between this play, Golden Thread’s Night over Erzinga (rooted in the Armenian genocide) and SF Playhouse’s Honey Brown Eyes (amid Bosnian ethnic cleansing). A drama about horrifically violated women in the war-torn Congo taking refuge in a bar and whorehouse caught between rival military factions equally given to such atrocities may not sound like the most enticing entertainment in the world, but Lynn Nottage’s Ruined was, as I put it in my review, “a breathtaking work of theater that’s not to be missed.” Tonye Patano’s formidable proprietor mama Nadi and Oberon K.A. Adjepong’s charming traveling salesman Christian had marvelous chemistry in South African-born director Liesl Tommy’s superb staging. Harold Pierce, Dan Clegg and Arwen Anderson in The Verona Project. Photo by Kevin Berne. On paper The Verona Project didn’t sound promising—a musical based on Two Gentleman of Verona in modern language, with nary a Launce nor Crab to be seen. Add to that a setup with a rock band performing a concept album all about love, and it could be a nightmare. But writer/director/composer Amanda Dehnert’s delightful comedy proved itself to be much more than Two Gents the Musical. She borrows the plot and characters of Shakespeare’s play but spins a story from these threads that’s entirely new and electric, with a touch of magical realism, witty dialogue, fiendishly clever storytelling devices, and some awfully catchy pop-rock songs. 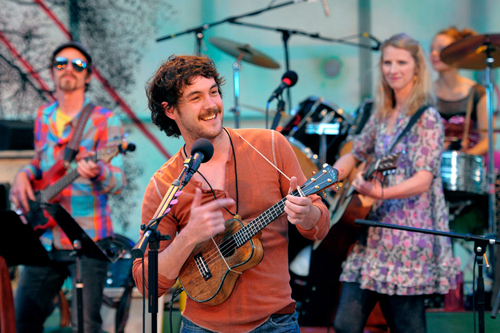 It was a breath of fresh air, terrifically performed by the young cast of actor-musicians. Audrey Brisson, Patrycja Kujawska and Éva Magyar in The Wild Bride. Photo courtesy of kevinberne.com. The only show on my list that’s still running, The Wild Bride at Berkeley Rep is a thunderous return for Britain’s Kneehigh Theatre Company and adapter/director Emma Rice after 2009’s acclaimed Brief Encounter at ACT. The shaggy-dog Grimm fairy tale about the misadventures of a girl with chopped-off hands pursued by the devil is given a stunning staging with bluesy tunes and three dancing actresses playing the harried heroine. It’s fierce and funny, inventively staged and entirely magical. Patrick Jones. Allen McKelvey, Megan Trout, Madeline H.D. Brown and Alexander Crowther in Metamorphosis. Photo by David Allen. Director Mark Jackson and a dynamic cast perfectly captured Franz Kafka’s tale of a hard-working man who awakes one morning to find himself transformed into a giant bug, much to the embarrassment of his family. Transplanting the story to the American 1950s keenly conjured the alienation and desperate need to appear to be the perfect family, hiding behind brittle, panicky smiles. Kimberly King, Anne Darragh, Charles Dean and Ken Grantham in A Delicate Balance. Photo by David Allen. I’d certainly seen Edward Albee’s woundingly witty 1966 play before, but what made Aurora’s revival so compelling was the superb performances throughout Tom Ross’s solid production. Kimberly King was magnetic as the tightly smiling matriarch, sharply keeping order in a home overrun with house guests: her smirking alcoholic sister, frequently divorced daughter, and old friends who find themselves suddenly terrified of their own house and won’t go home. King’s husband Ken Grantham was terrific as her mild-mannered peacemaker husband, as were Charles Dean and Anne Darragh as their pals beset with nameless dread. Remi Sandri and Adam Poss in The North Pool. Photo by Mark Kitaoka. The trouble with Rajiv Joseph’s suspenseful two-character drama is that you take one look at it and you’re pretty sure you know exactly what it’s about. A Syrian-American high school student of Iranian descent is called into the vice principal’s office after school for a friendly chat. Dr. Danielson won’t tell Khadim what this is all about and won’t let him leave either, trying to play good cop and bad cop at the same time. But the genius of the play is that it’s not just another post-9/11 paranoia story but something much deeper that cuts to the core of both characters. The play continually upturns expectations and its end is unexpectedly moving. Trish Mulholland and Catherine Castellanos in Phaedra. Photo by Pak Han. It’s been a fascinating 20th-anniversary season of commissioned world premieres for Shotgun, from the crazed Rasputin song-play Beardo from the makers of Beowulf: A Thousand Years of Baggage to E. Hunter Spreen’s fragmented romantic horror story Care of Trees. But my favorite had to be Adam Bock’s modern retelling of Phaedra, the Racine (by way of Euripides and Seneca) tragedy about a powerful man’s wife who’s fallen in love with her stepson—a young man who decidedly does not feel the same way. In Bock’s version the husband’s not a hero-king but a high court judge, and the son is a recovering drug addict trying desperately not to screw up again. But the focus is on Phaedra’s—or in this case Catherine’s—helpless discontent and monstrous self-delusion, achingly captured in Catherine Castellanos’s performance. Danny Wolohan, Arwen Anderson, Gabriel Marin, Rachel Harker and Patrick Jones in Bellwether. Photo by DavidAllenStudio.com. Marin Theatre Company had a very good year, with excellent productions of well-worn plays from Chekov’s Seagull to Albee’s Tiny Alice, August Wilson’s Seven Guitars to Tennessee Williams’s The Glass Menagerie, plus a very funny production of David Lindsay-Abaire’s Fuddy Meers. But my favorite show was their only world premiere this year, Steve Yockey’s Bellwether. It was also a good year for Yockey, whose Disassembly at Impact Theatre was delightful as well. But there was something about his ultra-creepy dark domestic fantasy about child disappearances in a Stepford suburb that felt like a great step forward in the playwright’s work. Ryan Rilette’s sharp production was also superb, with wrenching performances from Arwen Anderson and Gabriel Marin as the bereaved parents who find the gated community at their throats. One thing I did with last year’s list (and that I totally stole from Hurwitt the Elder) was that I gave special honors to a most valuable player of the year. I hadn’t planned to do it, but that year’s choice was so obvious to me that I felt I had to do it. This year I didn’t plan to anoint an MVP either, but the more I thought about it the more appealing it seemed to me to do it because the choice isn’t at all obvious this year. A lot of artists had great years this year, but in the end it really came down to several actors, any one of whom would be worthy of the honor, and it was a heck of a job trying to narrow them down. Try as I might to narrow it down to one, it kept gnawing at me that it could just as easily be another. So the heck with it—it’s my list, and I’m going to do two. Gabriel Marin and Arwen Anderson in Bellwether. Photo by DavidAllenStudio.com. Anderson’s parts this year couldn’t be more different: a frantic young mother struggling to be fair to her equally troubled husband in Bellwether and a young oddball in love, chasing a young man too selfish even to remember her, in The Verona Project. But Anderson was the aching heart at the center of both those plays, and the audience ached with her. Her adorably dizzy recovering addict daughter of a filthy rich magnate was easily one of the best things about Love in American Times, even if it wasn’t altogether clear why that character was even in the play. Marin’s fretfulness was infectious as the anxious father in Bellwether, the depressed husband in Collapse at Aurora, and even as a regular guy obsessed with worry that cybernetic enhancements are making him obsolete in SF Playhouse’s Wirehead. His angsty discombobulation made a small part memorable as the avenging son of a ruined man in Love in American Times at San Jose Rep. Marin’s so good at conveying gnawing worry and discontent that it can make your stomach hurt in sympathy. Both have given great performances before, and both surely have their best performances still ahead of them. I can’t wait. That’s it from me this year. I’m off for a badly needed vacation in London and India with my lovely wife, and will jump back into showgoing with both feet in the middle of January. A happy new year to all, and here’s hoping 2012 has many more theatrical delights in store. Surely the Mayans could tell us. Nice thumbs up to Arwen Anderson and Gabe Marin. Happy New Year Sam!